Exceptional scientific thinking - the development of the pulse water jet! For almost two decades VLN Advanced Technologies Inc. (VLN) has operated as an international “think tank” and research & development resource for Canadian Government Agencies and leading-edge Aerospace, Mining and Nuclear Power companies. VLN has provided on-going testing and research on specific applications and unique engineering queries. In doing so, VLN has become a world-renowned water jet resource offering our clients over 100 years of combined intellectual experience and technical expertise on the pulse water jet. September 1975, Dr. Mohan Vijay begins his career at National Research Canada (NRC), Ottawa, he is tasked with research and applications development of cavitating and pulse water jets. During his time at the NRC, Dr. Vijay oversees a broad range of water jet projects for clients across several industries. In 1989 government budget cuts lead to the termination of the pulse water jet project at the NRC. However, with support from HDRK Mining Research Ltd, a former NRC client, Dr. Vijay was reinstated and able to continue his research on pulse water jet technologies with a focus on the mining industry for another four years. Although the research and projects for rock-breaking showed great progress and promise, HDRK changed its business focus resulting in the end of it’s four-year funding contribution. Government funding continues for another three years. Once again government funding issues began to threaten Dr. Vijay’s work, and he decides to leave NRC after 22 years of service in the Center for Fluid Power Technology. Determined to continue his research and bring the technology to market, Dr.Vijay formed VLN Advanced Technologies Inc.with the mission of developing and commercializing the pulse water jet technologies developed through his research projects and initiatives. VLN offers an alternative to UHP by introducing Ultrasonics into the water stream and officially launches the RFM 2000 Generator. The revolutionary and innovative new equipment provided the coating removal and surface preparation industries. with a much sought after alternative. Once installed the RFM 2000 increased the impact pressure of an existing pump by over 3 times the pump Pressure! Joint Project with ATK Thiokol for removal of coatings and propellant for the Space Shuttle rocket boosters. VLN Advanced Technologies and ES3 in Utah sign a teaming agreement to participate in an SBIR Program for the U.S. Air Force removing Chromium from landing gear parts using only water and the Pulse Water Jet system. VLN Advanced Technologies and Messier Dowty deliver a joint presentation at the HCAT Conference in New Orleans on HVOF coatings removal from landing gear pins resulting from a project conducted by VLN for Messier Dowty. United Technologies Corporation’s Pratt and Whitney U.S., a leading designer, manufacturer and servicer of aircraft engines, closed a multimillion-dollar deal with VLN. Pratt and Whitney will commercialize VLN devices as cost effective green solution for cleaning, coating removal and surface preparation. VLN Reach Foundation is set up supporting the Make A Wish Foundation, the Ottawa Hospital Foundation, the Ottawa-Carleton Association for Persons with Developmental Disabilities, the Brain Injury Association of Canada, Propeller Dance and also makes significant donations to several other charities each year. Today VLN Advanced Technologies is known the world over as being the leader in pulse water jet technology for customized solutions. We provide experienced knowledge and solutions to many manufacturing and industrial challenges. VLN ‘s R&D and consultation partners include Canadian Department of National Defense, U./S. Air Force, Swedish Army, NATO, Canadian Shipping Engineers, Royal Canadian Mounted Police, the Canadian Coast Guard and numerous commercial entities around the world. 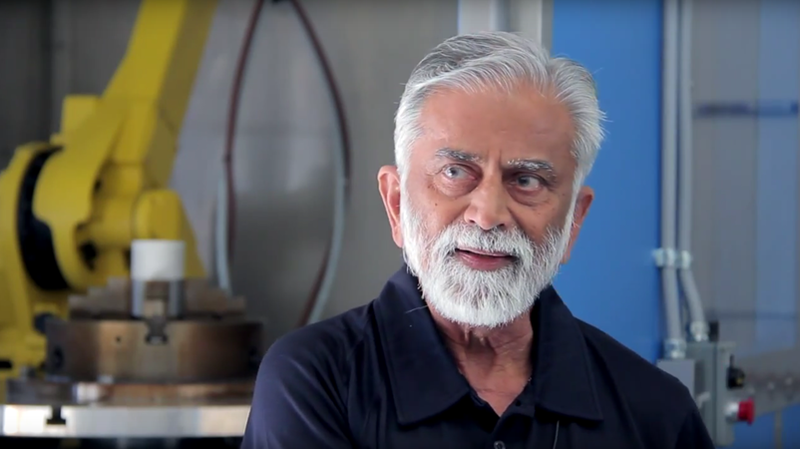 VLN holds eight patents relating to pulse water jet technology processes and applications and its founder Dr.Vijay is viewed as the “Father” of pulse water jet engineering, the leading expert in pulse water jet technology in the world.